Other Products by Pro Supps. Search other Protein Powder products. Pro Supps My Shake is not just another protein shake. In fact, we'd go so far as to say it's anything but. Enhanced with MCTs for fast energy release, and CLA for supporting a healthy body with more muscle and less fat, Pro Supps My Shake has been created with the idea that supporting a healthy body doesn't have to be bland. This great tasting delicious shake will take you one step closer to getting to where you want to get, no matter what your physical goals are. After all, realistic goals are the foundation for human performance and achievement. Solid nutritional support is the cement for that foundation, which is why Pro Supps My Shake was originally conceptualised. To support you on your way to greatness. Scientific research has been prolific over the past few decades, with information piling up regarding the nutritional advantages of dairy-sourced protein. Pro Supps My Shake contains both of the quality proteins found in milk, which are whey and casein. Remember little miss muffet, eating her curds (casein) and whey? Well, she knew all about the benefits of these two protein sources to help keep her shredded and jacked. Or maybe she didn't ... Anyway, the moral of the story is that casein and whey are both quality bioavailable protein sources that each contain all of the essential amino acids, and stimulate a biological process called muscle protein synthesis (MPS). Bet you little miss muffet didn't know that. Pro Supps My Shake contains two casein-containing proteins, called micellar casein and milk protein isolate. While the whey protein concentrate is a solid source of whey protein, containing all of the essential amino acids, which are important for stimulating MPS and improving muscular adaptation and muscle healing1. Given that whey protein has such an excellent amino acid profile and bioavailability, it also has myriad health benefits associated with its use2. Given that casein is a large and complex protein molecule, it takes time to digest and absorb the amino acids. This means that once ingested, blood amino acids are sustained over a longer period of time than whey protein, and muscle are fed for longer. Interestingly, despite whey protein's popularity, casein has been demonstrated to be as effective as whey protein in stimulating MPS over an extended period of time 3. This is evident in the fact that whey protein peaks early and sustains you for an hour to an hour and a half, while casein's benefits stretch over multiple hours. Pro Supps My Shake premium trisource protein with the idea that no matter how hard you train or what you're training for, a scoop of myshake will help you get there. Mix 1 serving (1 scoop) into 350-450ml cold water and consume. 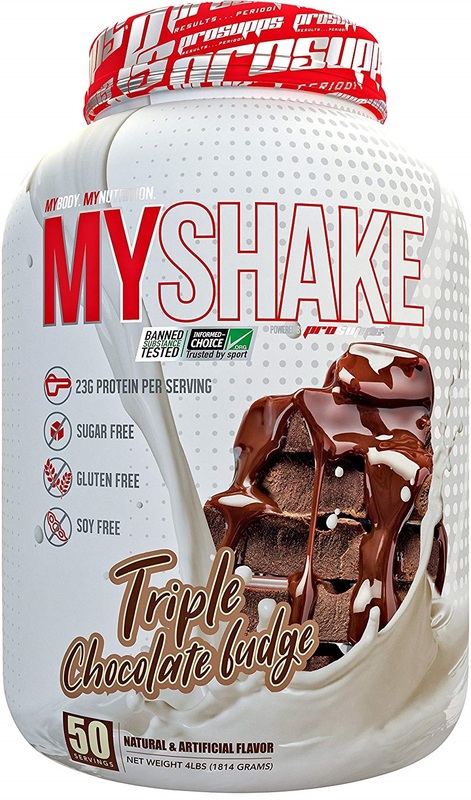 Ingredients: MyShake Protein Blend (Whey Protein Concentrate, Milk Protein Isolate, Micellar Casein), Cocoa Powder (alkali processed), Natural and Artificial Flavours, Salt (Sodium Chloride), Soy Lecithin, Modified Gum Acacia, Cellulose Gum, Xantham Gum, Carrageenan, Guar Gum, Acesulfame Potassium, Sucralose, Potassium Chloride, MCT Oil Powder, Conjugated Linoleic Acid. Allergen Warning: Contains ingredients from milk and soy. Made in a facility that also processes wheat, sesame, egg, peanuts, tree nuts, fish, crustaceans, shellfish oils products. STORE IN A COOL, DRY PLACE. Content sold by weight, not volume; some settling may occur. Protect from heat, light, and moisture.